Lupine got her first Rally Excellent leg at the Red Deer Show and then passed two more legs at the Lethbridge show, finishing her title. She really enjoys competing in rally and is lots of fun in the ring. We had a few hiccups along the way, as the excellent level is a lot harder than the other levels! Mostly my fault, not hers. Lupine is now Ch Prairielight Blazingstar Kini CDX WC JH RE. 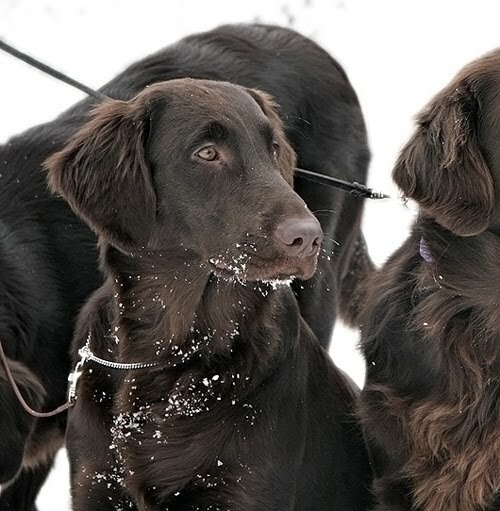 She is the #2 rally obedience flat-coat in Canada, second only to our friend Sarah's dog, Kaleb! Kona and Judy had a very successful time at the Red Deer Show in early November. Kona, Blazingstar Brown Coneflower, won Best of Winners on Saturday and Winners Female on Sunday, for a total of 5 points. She now has 8 points towards her championship. She also finished her Rally Novice title. Still catching up from the summer.... Both Sam and Lindy, on Vancouver Island, had lots of success in the field this summer and fall. 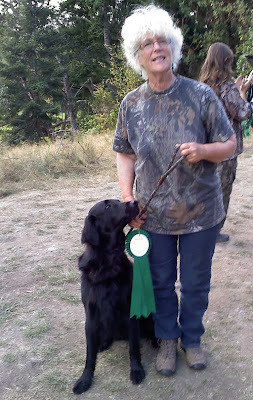 Sam, HRCH Blazingstar Bobolink JH TD and Sylvia had passed his first Senior Hunter leg and also completed his Hunting Retriever Championship title. Lindy, Blazingtstar Linnaeus CDX JH WCI RE AgIS AgIJWWS CGN, and Rod finished their started hunting retriever title. 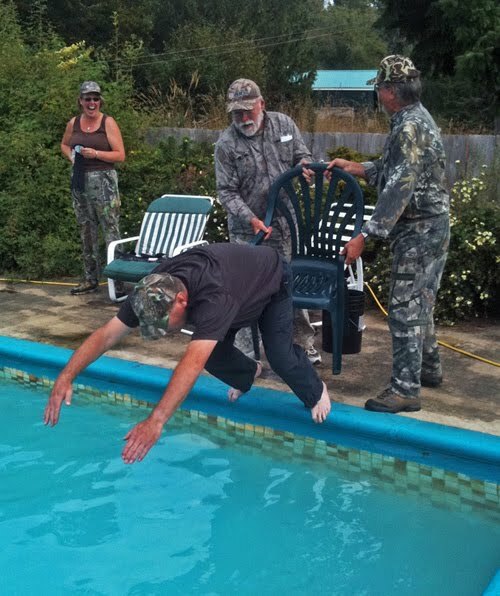 There is a strange tradition on the Island, where handlers who finish titles are dunked in the water, hence the funny photos of Rod and Sylvia about to hit the water. 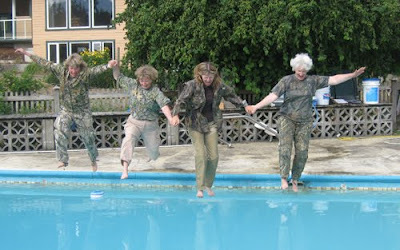 I really think it should be done in a pond though..... not a nice clean swimming pool! Congratulations Rod, Lindy, Sam & Sylvia! 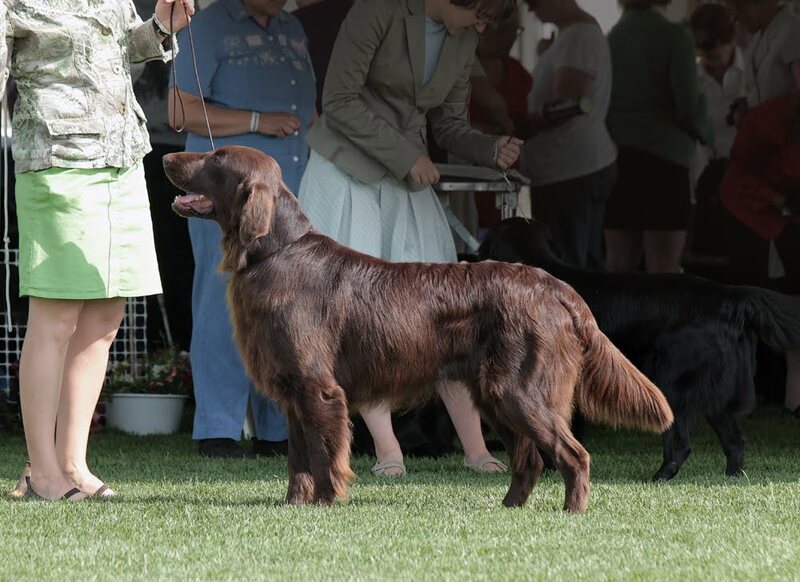 In September, Annie (HRCH Blazingstar Beaufort CDX SH CGC) passed two Master Hunter tests. These were the first Master level tests that she has run and we are so proud that she passed them both. Congratulations to Annie and her owners, Katy and Brian. These are the first ever Master Hunter legs for a Blazingstar dog. 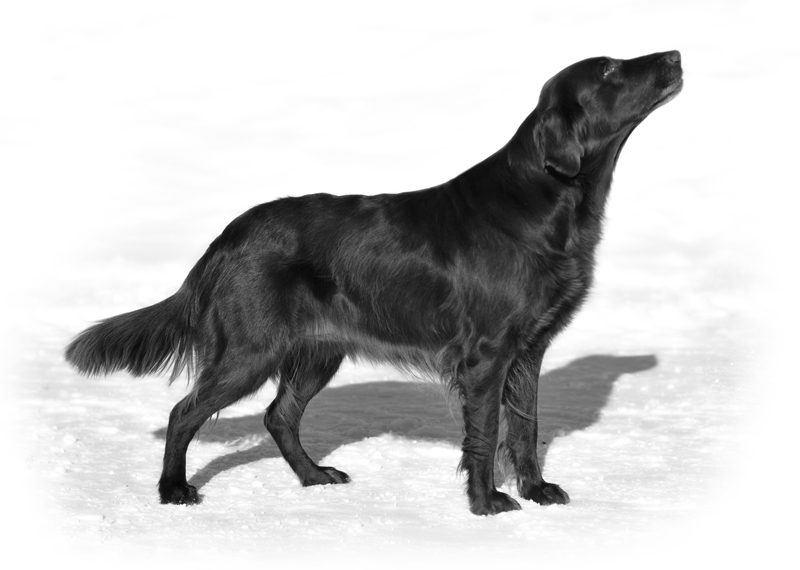 Annie is a daughter of Huxley and Lupine. Her housemate, Gusty, also got two MH legs. Congratulations girls! At the end of July, Liz packed up the van and took Tinbie, Lupine and Cava to the National and Regional Specialties in Calgary. At the Alberta Specialty, Lupine won Best Veteran in Sweepstakes under UK judge, Sue Jones - what a thrill! Then Cava, at her first ever show, won Best Puppy in Show under UK judge Vivianne Bowen. That was a very good day for us! At the Canadian Specialty, Lupine pulled off a perfect score of 100 in the Rally Advanced B class, winning the class. Tinbie finished his Rally Novice title. Rod Deacon's Lindy won the Open B class in obedience. Kona placed 3rd in Rally Novice A in the Alberta trial and also qualified in the National trial. Cava won the 6-9 month class in puppy sweeps and Lupine placed 2nd in her class in veteran sweeps. 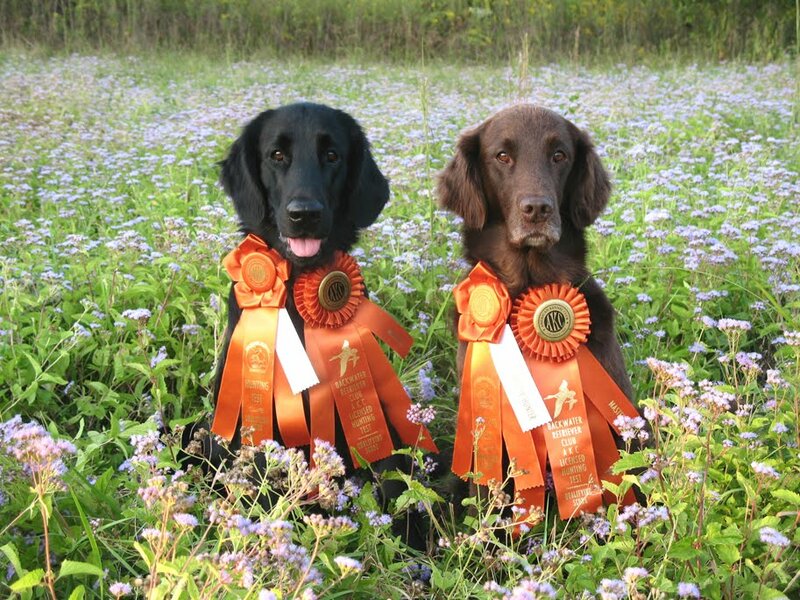 In the regular show, Willow and Kona placed 1st and 2nd in a very competitive 12-18 month class. Willow is Blazingstar Brown Buffalobean and Kona is Blazingstar Brown Coneflower. We were very proud of those two girls! They both looked great in the ring. Liz was very brave and took them both in to the Brace competition, but we were not very coordinated and placed 2nd, out of 2, in the class. As usual, the best part of the show was meeting up with old friends, making new ones and visiting with our dogs and their relatives. We finally got to meet Merlyn (a Huxley son) and his owners Danusia and Bob, who live in Ontario. Thank-you to everyone who helped me at the specialty - especially Pat for showing Tinbie and Darren and Michele for helping me set up and take down my shade tent and generally stay organized. Thanks to Christine for letting me show off Willow. And to Rod, Julia, Margareta, Karen, Sarah, Amanda, Judy, Heather and anyone else who I roped into holding dogs for me at ringside! Andy stayed at home and looked after Teva and her puppies.